It all started in the early 1980’s when a small group of British Car aficionados decided it was time to bring the British Field Meet concept to Alberta. Their motivation stemmed from reading British publications of various motorcar "meets" in England. Although there were similar "Gatherings Of The Faithful" in Edmonton, these semi annual events focused mainly on older MGs, Jaguars and Austin Healeys. As there was nothing locally that celebrated the full spectrum of British motoring culture, the stage had clearly been set for something grand. The creation, in 1986, of the Alberta All British Motoring Society hit the starter button on annual field meets in Alberta. The plan was to alternate All British Field Meets between Edmonton and Calgary with the respective Classic and British car clubs from each city hosting the event while pooling their resources with one another. As a result, the Vintage Sports Car Club of Calgary hosted the first "meet" in 1987. This was followed by a second "meet" in 1988, hosted by the newly formed Alberta All British Motoring Society. Originally Wetaskiwin was chosen as the “northern” venue because of strong support from Alberta Culture and the potential for future association with the world class Reynolds Alberta Transportation Museum slated for that city. After two successful "meets" in Wetaskiwin, the AABMS moved the venue to Edmonton and began it’s long standing relationship with The City of Edmonton - Parks and Recreation and sponsors including the Oxford and Competition Insurance companies, Hawkins Automotive, Brit Bits, MOTOPARTS INC., Collingwood Motion, and Sports Car Centre. 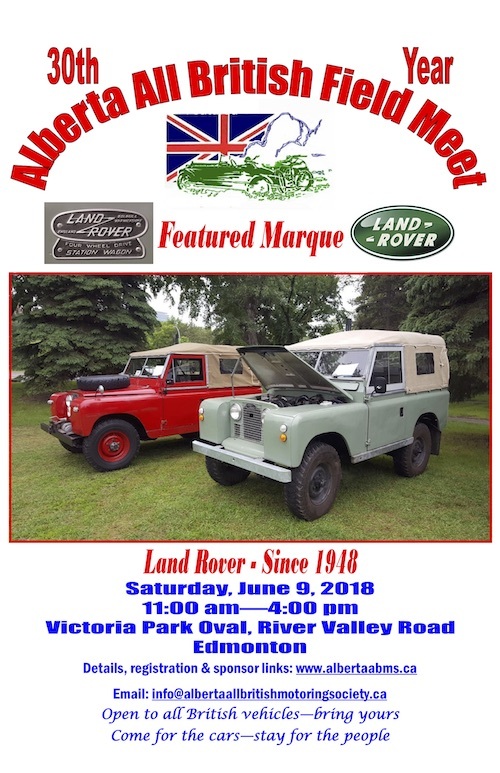 These companies were key to our success in the beginning and today our sponsors continue to play a significant role in making the Alberta All British Field Meet a fundamental part of our Alberta motoring culture. 2016 marked the first year of expanded, annual, All British Field meets.